I've posted a video describing technical details of the indoor photovoltaic energy harvesting solution implemented in the Firefly Cap. I hope you like it! 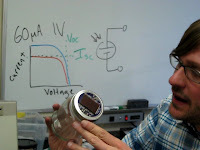 I'm curious- how does the response curve change in sunlight to enable charging of the 1.2V battery? In full sunlight, the crystalline silicon panel can produce current at more than 1.2 V. The curve is shaped the same, but the open circuit voltage is perhaps 2 V and the short circuit current is more than 1 mA. Wow... This is really impressive Michael!! Congrats!